Fair warning: I’ll probably be reviewing a few more Scandinavian movies and TV shows than usual in the future. Or not; maybe I’ll get tired of them. Since I’ve become (peripherally) associated with the Norwegian film industry, I figure I ought to have some familiarity with the field. The film The King’s Choice, released in 2016, is probably the most acclaimed recent movie out of Norway. It is not one of those that “my” company worked on, but I decided to see it, so I’d be able to discuss it at all those industry cocktail parties I expect I’ll be invited to soon. 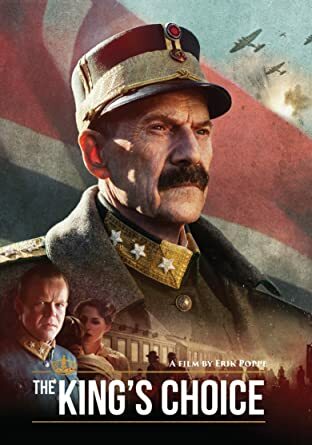 The film concerns Norway’s King Haakon VII (played by a Danish actor, Jesper Christensen. This makes sense, as King Haakon began life as a Danish prince. I was delighted to find that I could identify his Danish accent when he spoke). When he became king of Norway in 1905, he changed his name to Haakon and his son Alexander’s to Olav, because those were the names of the last two kings of the old royal line in the 14th Century. Thus, he symbolically picked up the dynasty where it had broken off – and by and large the Norwegians loved him for it (except for a few stubborn republicans). At the beginning of the movie, it’s 1940, and Haakon is an arthritic old man with a purely ceremonial job, mostly occupied with playing with his grandchildren. But word comes suddenly that the Germans have invaded, and he, his family, and the government flee northward, sometimes under enemy fire, beginning what will come to be a long exile. Eventually he will be approached individually by the German ambassador, and faced with a very hard decision. The Germans, frankly, handled Norway ham-handedly. At the beginning they could have made a reasonable case that they were coming to “rescue” Norway from the English and French, who had violated international law by mining Norwegian waters. However, the Germans came in like invaders, rousing Norwegian defenses to sink one of their battleships. It went downhill from there. The German ambassador here is an intriguing character, a man of good will who genuinely wants to facilitate a peaceful occupation. But the generals and Hitler himself force him into a position where he must make demands that the king cannot countenance. You could argue that “the king’s choice” cost a lot of unnecessary deaths. But in the larger view, he took the right side – and what would have happened if the Norwegian resistance had not stymied German nuclear research doesn’t bear thinking about (that’s my own thought; it’s not a theme of the movie). I expected it to be strange, watching men I’ve seen in real life (King Olav and his son, the present king, Harald) portrayed on screen. But it wasn’t. Not sure what I was expecting. Well acted, relatively authentic in historical terms, The King’s Choice is a very well made historical drama. I don’t know what it will mean to people without an ethnic connection to the story, but it’s worth your time. Suitable for teens and up. You can watch it on Amazon Prime.